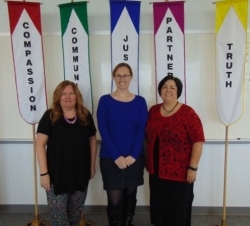 Three Queen of Peace faculty members are the proud recipients of the Beck Blended Learning Initiative Grant. The grant is designed to provide teachers with tools to help them combine classroom learning with online learning. The three grantees Kristine Owens (Social Science), Sara Svoboda (Science) and Catherine Klod (English) attend graduate level courses at Dominican University each week to learn more about applications and web tools that they can integrate in the classroom. “We are delighted that three members of our team have been selected to partake in this program. As a STEM school we understand and appreciate the need for hybrid courses that keep students engaged both via classroom instruction and web based initiatives. We look forward to these three recipients sharing their best practices with the entire staff,” said Hedi Belkaoui, Principal at Queen of Peace.